They have a specialty called The Bomb, which is a hot dog grilled with baloney served on top of coleslaw and russian dressing. This sounded very exciting and I eagerly bit in when it arrived. I love the combination of fat with fat! However, I am sorry to say that this particular combination did not work for me. 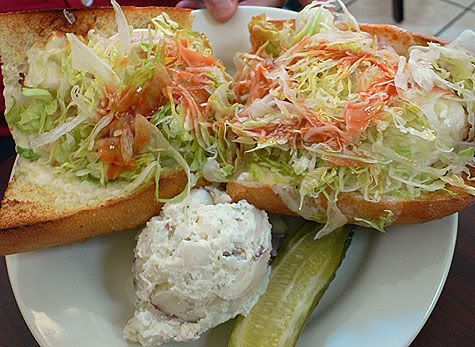 The bread was dry and swimming in russian dressing which was cloyingly sweet. 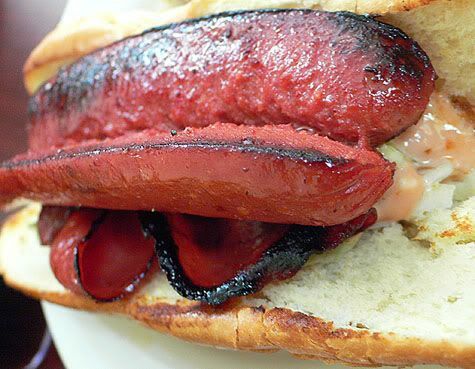 I ended up taking the dog and baloney out of the bun and eating them with the spicy mustard. I think that the concept is still good, I liked how the baloney added a nice chewy crispy texture, but I’d get it without the russian dressing and maybe get grilled onions on top… and the slaw that was good for added crunch. 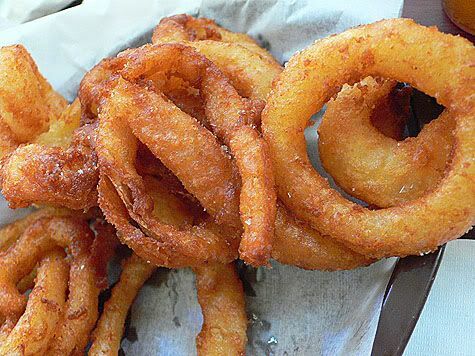 I have a weakness for Onion Rings and Millers makes them the way I like them… The thick slices of onion are covered with the perfect amount of batter and faultlessly fried so that the onions steam and cook within until they melt when you bite through the crisp crust. They went very well with the hotdog and fried baloney. 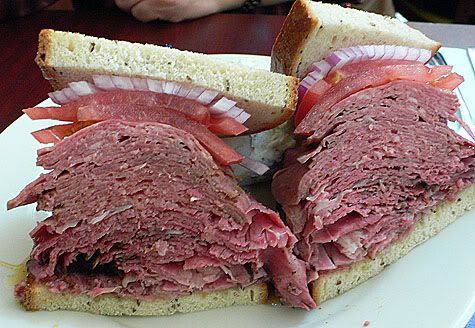 They make big sandwiches… I mean really big, as in epic, heroic sized portions. 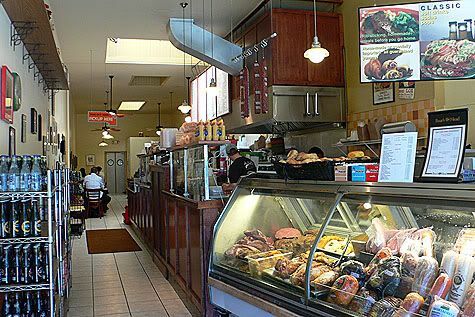 ES ordered the Italian Cold Cut Hoagie, Ham, Capicola, Pepperoni, Genoa Salami, Mortadella and Provolone Cheese on rye. 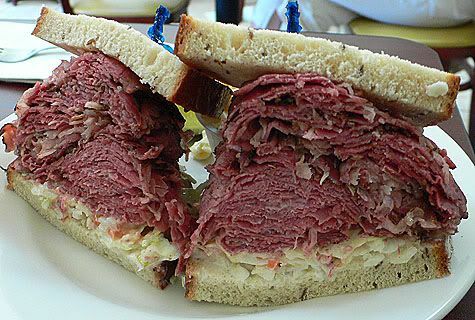 AL, the boss, ordered The Chief, which was piled high with Corned Beef, Pastrami, Russian Dressing and Coleslaw. He got macaroni salad and thought it was bland. Each plate came with your choice of potato salad, macaroni salad or coleslaw. Our waiter said that the potato is the most popular, so that is what I ordered. 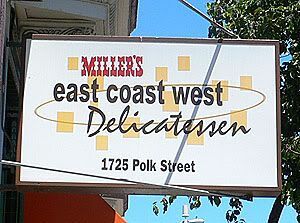 It was pretty good but couldn’t compare to the potato salad at Saul’s in Berkeley… overall, the quality doesn’t even come close. I noticed that they have an extensive breakfast menu and the woman seated next to us was hoarding two loaves of chocolate babka that looked freshly made. I’ve only tried a few things so far, and this was my first bomb… so I’ll be back for more of those onion rings and there were lots of hot dishes like brisket with gravy that looked absolutely delicious. Next post: Dining Al Fresco, Hog Island Oyster Co.